Stake holder include G4S, Tops Security, Checkmate Services, Bombay Intelligence Security India, ISS SDB, SLV Security Services, SSMS, Premier Shield, Securitas India, Trig Guardforce, SAI, KSS and an Agency representing smaller companies. It is also represented by members from NSDC, CAPSI, CII, FICCI and Army Welfare Placement Organisation (AWPO) amongst others. Promote skill development of the manpower in the PSS and narrow existing gaps between demand and supply. 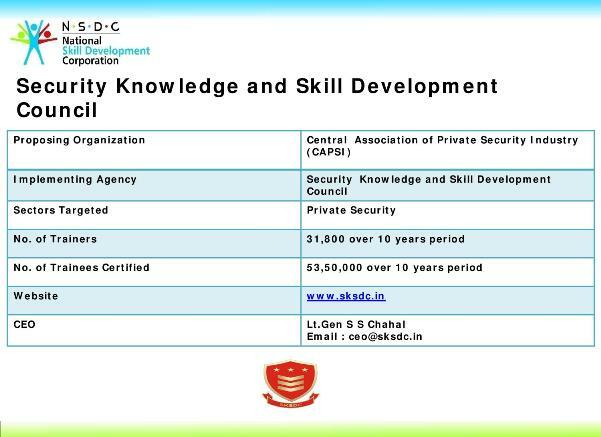 Develop framework for upgrading skills of Security Guards to international standards. Undertake research to identify future requirements in training and skill enhancement. Initiate, carry out, execute, implement, aid and assist activities towards skill development in the PSS. Develop skill development plan for the PSS. Determine skill/competency standards and qualifications. Establish well structured ‘Labour Market Information System’ to assist planning and delivery of training. Facilitate in standardizing the affiliation and accreditation process for the PSS. Identify skill development needs, review international trends and identify sector skill gaps and technology. Undertake task of education and vocational skill upgrades. Institute Assessment & Certification process. Identify skill gaps at each level & trade and develop course curricula, training programmes and training manuals. Setting of National Occupational Standards, Benchmarks and Testing for each level and trade in the PSS. Plan, execute and certify Training of Trainers. Identification, selection and accreditation of Training Providers in PSS across the country and promoting them as Academies of Excellence. Creating a nationwide data base of trained manpower in the PSS, level and trade wise. 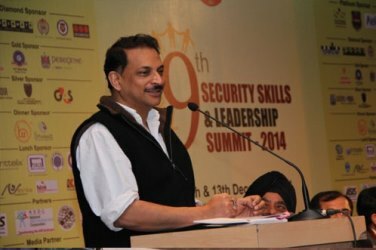 Address: Security Sector Skill Development Council (SSSDC), 305 City Court, Sikenderpur, MG Road, Gurgaon – 122002.